All the institutional framework of HMGN is regulated and determined by the law of the land. Such institutions receive their mandate from a number of legislation and each of these is reposed with specific functional responsibilities. We will first take a close look at various functions of the institutions committed for the development of hydropower in Nepal and examine problems and constraints inherent or otherwise in them. The practice followed so far by the HMGN seems to be the signing of Memorandum of Understanding (MoU) with the private sector in lieu of issuing a “Letter of Intent” prior to formal issue of a license. Certain quarter believes that MoUs are not worth the paper these are written on. However, HMGN needs to be wary of the potential for damage claim from the other party to such for its breach. The situation does not seem too gloomy at the moment because HMGN has not been taken to court so far. For example HMGN signed an MoU for Upper Marsyangdi (43 MW) and Middle Marsyangdi (42 MW) Projects with CIWEC in collaboration with Matthew of Canada, Andrade G utierrez of Brazil and Gulf Syndicate of UAE. At present Middle Marsyangdi is being undertaken with German grant in aid and the party signing the MoU was simply cut out of the deal by HMGN with respect to Middle Marsyangdi. Sub-Sections (1) and (2) of Section 4 of Electricity Act, 2049 read together makes it mandatory to issue survey license within 30 days of receipt of an application . Accordingly, HMGN has issued a number of such licenses and many of them are floating around without moving forward, relative to the number of them that have materialised. This leaves an impression that HMGN is mandated to be too liberal in the matter of issuing licenses by the legislation. However, such a phenomenon also pre-empts other developers from working on such projects. There is no mechanism prescribed for the purpose of evaluating applications in order to ensure that any specific applicant has capability to bring the project to fructification. Without spelling it out, the existing hydropower development policy, in effect, enunciated “first come first served” concept with regards to issuing of license. However, it was thought that this practice does not allow for competitiveness. This was deemed a policy defect. By way of rectification of this apparent defect “requests for proposal” (RFP) were invited for a number of projects publicly a short while ago. Now HMGN is preparing to issue such licenses. However, there is no provision in the policy and the Act to ensure competitiveness. Survey license should have been granted within 30 days, but were not granted. As there is no mechanism to appeal against HMGN’s such failure, questions arise as to how does one get the problem redressed. Besides counter questions were also posed as to why should a foreign investor even bother to appeal. Private sector feels that time frame must be adhered to. The failure to grant the survey license within 30 days is being viewed as abuse of authority on the part of HMGN. The strong feeling in the private sector is, if even HMGN flouts the law of the land then how can it expect its citizen to abide by the same law. Additionally, HMGN, reportedly, did not formally give any reason for its failure to issue the license within the time prescribed by the law. This is being viewed as lack of transparency. Thus the RFP process is being branded as flawed and it is being opined that the concept of calling for tenders is not viable. Moreover, in the case of survey license that could be true in view of the fact that ranking of response to RFP for survey license is tricky if there are more than one applicant. At the best it should be done on the basis of capability to perform. Cost cannot be appropriate scale to arrive at a decision whether to award or not. The appropriate basis for ranking such proposal must be what and how much Nepal stands to gain. There is another dimension to the process of inviting bids (or calling for tenders) for survey license from the private sector instead of granting them on the basis of initially conceptualised policy in this respect. In this scenario there is no guarantee as to whether a survey licensee ultimately finishes up getting the generation license or not. Because the generation license will also have to be granted on the basis of competitive bidding and the original license-holder for survey may not be awarded a generation license eventually. In this case how does the survey license holder recover its cost of the feasibility study, the report of which becomes HMGN’s property? To get private sector conduct feasibility study without any assurance of them getting generation licenses, in case HMGN decides to invite tender for generation licenses, is being described in certain circles as the naivete on the part of HMGN. Therefore, it is incumbent upon HMGN to make up its mind as to the way forward, formulate a specific policy for the purpose, make necessary changes in the law and then go about having such projects requiring huge investment implemented. Sub-Sections (1) and (2) of Section 4 of Electricity Act, 2049 read together also makes it mandatory for HMGN to issue license for generation, transmission and distribution of electricity within 120 days. The policy is deafeningly silent with regard to how to strike a best deal in order to maximise return to the state. No mechanism for the purpose is spelled out. This is a serious flaw needing prompt remedy. It is normal and logical for a generation license to be conditional upon successful financial closure within a certain date. This allows HMGN necessary latitude to have another investor come into the picture if the original licensee is not able to arrange fund for the implementation of the project within certain time period. However, a conditional license, reportedly, has also been issued with an instruction to have the Power Project Agreement (PPA) amended. Current Nepal law does not empower HMGN to dictate a developer to amend PPA and the private sector is deeming this action, on the part of HMGN, not business-like [however, as it is the more than majority holder of equity in NEA, it is in a position to ask NEA to renege on the deal – the PPA]. It is being reported that the reason behind needing to have the PPA amended is the excessively high return on investment in this particular project that became apparent afterwards. However, similar review of PPAs have not been required from other developers whose total project cost has also reportedly gone down, with the resulting effect of enhancement of return on investment. Certain sources in the industry feel that duration of license for electricity generation, transmission or distribution of a maximum of 50 years is too long for foreign owned project. However, as this is a discretionary power vested in HMGN and the change in the term of the license can result in change in the buy back rate to be paid by NEA in the case of a plant designed for domestic consumption. Similarly, variation of the term of license can be matched with revenue stream to HMGN from an export-oriented project. Therefore, judicious use of this leverage can result in all round benefit. However, what is important in this connection is the fundamental philosophy behind inviting foreign private investment in the hydropower sector, which is the fact that Nepal stands to receive the hydropower plant at the end of the term of the license, all clear . This is, for example, how the hydropower revolution occurred in Norway. She has undergone a metamorphosis from a relatively poor European country less than five decades ago to an affluent one at present and one of the contributing factors was the extensive exploitation of hydropower with foreign investment. However, the precondition for meaningful hand-over is the simple assumption that the plant remains operable even after the expiry of the license and for a substantial number of years thereafter. For this purpose the construction and erection of the plant including the quality of equipment used for the purpose needs to meet high international standard. Therefore, the Project Agreement must lay down design life of the Project where the HMGN stands to receive such plant handed over to HMGN after expiry of the license. Moreover, development of design standard and construction standard is also imperative for this very reason among others. A certain segment of legal fraternity deemed the provision of transfer of ownership of a hydropower plant, established with more than 50% of the total investment made by foreign entities, to HMGN after the expiry of the license in 50 years, mandated by Section 10(1) discussed above, as the infringement of constitutionally enshrined fundamental right to equality. This argument does not hold any water as the fundamental idea behind inviting foreign investment is to allow the investors to use the plant to reap necessary benefit in such a way that after a certain period of time the ownership and the benefit appurtenant thereto gets transferred to Nepal and Nepal gets to be ultimately benefited form the exploitation of its own natural resources. As mentioned above this is how it was done, for example, in Norway too. The whole deal will be geared for such eventual transfer and the foreign investor(s) so far have and will develop and use the plant in such a way that they will be ready to leave after the period. Hence, there is no question of unequal treatment. Section 3 of Water Resources Act, 2049 categorically state that “the ownership of the water resources available in the Kingdom of Nepal shall be vested in the Kingdom of Nepal.” Under the authority vested in HMGN by this provision HMGN is fully empowered to issue licenses, permits, approvals for the exploitation of the water resources for its various potential uses. Under the Proviso Clause of Section 3 of Electricity Act, 2049 no license is required for generation of electricity up to 1 MW at present. The recently formed government has made public its intended policy of de-licensing hydropower plants of up to 10 MW. As a step in line with the policy of liberalisation and deregulation this is a welcome step. However, this decision has ramifications on HMGN’s royalty income because the royalty is payable only by a “licensee.” The hydropower development policy specifically mentions that no royalty is payable by a developer for a plant of up to 1,000 KW capacity for which no license is required. However, a license has two important roles to fulfil. Firstly it is very comforting for an investor to be armed with an authentic document from HMGN stating that the licensee is entitled to do whatever is mentioned in the license and the appurtenant legal provisions. This sort of comfort is very important, especially for the foreign investors, as they would be very unfamiliar with conventions and practices of Nepal. This becomes, in fact, imperative in the case of foreign lending institutions (one even will need to include Nepali financial institutions in this category). Second important reason for a developer preferring to choose the comfort of a license is the fact if the developer happens to be from somewhere else he will be as good as a foreigner for that part of the world. In such a circumstance the pertinent question begging answer will be who will assure of the availability of water for the plant and how is the access to water gained. Conversely if the developer is locally from the area of project site then he will face relatively very little problems from his neighbours and villagers. For an investor/developer being able produce a license issued by HMGN, subsequent to due process, goes a long way in commanding respect for the project form the users of the water for time immemorial. One must admit that the Section 3 of the Electricity Act, 2049 has made provision for maintaining an audit trail of documentation in the form of submission of notification to the prescribed officer prior to undertaking any work connected to the specific body of water in the case of a hydropower plant of the capacity ranging from 100 KW to 1,000 KW. The evidence of receipt of such notification will establish the prior consumptive right and the same will be used, obviously, for the enforcement of such right. However, a developer will need stronger evidential document to get away with depriving users in the downstream area of the river from the benefit they were enjoying in the past. Similarly, the developer will need documentary help to safeguard his prior consumptive right against future bulk users in the upstream areas. Therefore, it is advisable to simplify the procedure for acquiring license for hydropower project up to 10 MW compared to bigger projects rather than doing away with the provision for the issue of license. There are people who subscribe to the idea that water also needs to be made real property right, freely saleable, transferable, etc. If such changes are made then the principle of equity will need to be introduced hand-in-hand with the real property right over water in order to ensure that drinking water, irrigation, etc. get the priority that these deserve. One of the benefits of development of hydropower in Nepal lies in its ability to generate employment for Nepali professionals, consultants, skilled workers and unskilled workers. Hydropower being a capital intensive development work, employment of Nepali nationals during the post-construction period will be limited. Thus, maximisation of local employment can truly occur only during the construction period. However, informed opinion expressed apprehension that, unfortunately, the employment of locals’ stays limited largely to the labour force during the construction period. Thus the total number of Nepalese employed seems very high but in terms of remuneration paid, the fewer expatriates end up receiving more than total spent in salary and wages to the Nepali staff and the whole labour force of the entire project. Besides, this factor also jacks up the tariff charged to NEA in the sense that if the expatriate component of the manpower can be reduced the total cost of construction will go down and same can be reflected in the tariff charged to NEA if the second method of determining the tariff prescribed by the Electricity Act is faithfully used. The converse side of this issue is the need of the developers/sponsors to provide an employment opportunity to their own work force and when the high salary paid to expatriate staff can be recovered through tariff why would a foreign developer bother. Some even went on to add that the expatriates that deign to come to work in a backward country like Nepal are those who do not get decent job of comparable level in their own countries, except for the diplomats, motivated people like missionaries, etc. Thorough transparency is required in this respect during negotiation of tariff and recruitment of expatriates. More importantly, transfer of technology is the imperative behind the principle of maximisation of local employment. In other words the importance of the policy of maximisation of employment of local manpower gains an additional dimension of significant importance in view of the fact that effective means of technology transfer is the employment of local talent in the maximum possible number. Otherwise, the whole thing will turn into an exercise in “spoon feeding;” foreign entities come to Nepal build a plant and leave which will result in Nepali nationals not being able to even operate and maintain it; and replicating them with Nepali manpower will stay a wistful thinking. In line with any country’s national interest this policy is very important. This is incorporated in the hydropower development policy . As a mechanism to ensure that the two cornerstones of Nepal’s development are properly laid and cemented, foreigners are not allowed to work in Nepal without being granted work permit. Moreover, in fact, this practice is universally followed in most of the countries, much more strictly in the affluent countries, which can actually afford foreign manpower, which tends to be cost effective for them. In the case of a poor country like Nepal employment of foreign manpower not only deprives Nepali national of the much needed employment opportunity, but it also raises tremendously the price, for example of electricity, that the Nepali consumers are forced to pay. Therefore, all along each time a developer needed to engage an expatriate for any specific job the developer had to apply for the issue of “work permit” from the Department of Labour. Rule 6(1) of Labour Regulation, 2050 was very clear that non-Nepali shall be granted work permit only “in case no skilled Nepali national is available for employment.” However, as a gesture of goodwill towards the hydropower projects and its developers the Labour Department refrained from asking the projects to furnish documentary trail to the effect that the Project has tried to locate Nepali national skilled for any specific post prior to issuing the work permit. HMGN, in its apprehension that only lip service is being paid to the concept of utilising, as much as possible and to the extent qualified, the available local skills and labour crafts, it made certain changes to Labour Act, 2048. One of which was the insertion of Section 4A. With the insertion of the new Section 4A in the Labour Act, acquiring work permit has become a slightly involved process, requiring certain lead-time. However, as stated above it is not true that prior to this amendment such procedure did not exist. The Sub-section 2 of this section makes it mandatory to publish advertisement in national-level public newspaper to ensure that a Nepali is not available for any specific technical post. This is basically to ensure that no eligible Nepali national is available for a specific post or no such person is being deprived of an opportunity of employment. Therefore, the officials of Labour Department are now not in a position to circumvent the “due process” any more in contrast to the past practice. Moreover, under Sub-Section (1) Section 4A of the Labour Act “non-Nepali nationals may not be appointed” in any non-technical post. Section 6(2) of the Foreign Investment and Technology Transfer Act, 2049 stipulates that “a foreign investor or dependant family or authorised representative of such foreign investor and dependant family shall for the purpose of stay in the Kingdom of Nepal be provided a business visa until the foreign investment is retained.” The proviso clause to this Section makes provision for the issue of a “residential visa” if a foreign investor invests more than US $ 100,000 at one time. These provisions are designed for the representatives of the investors. However, generally a foreign investor would use a development company registered in Nepal as vehicle to forward the cause and they would prefer to have certain staff from the mother country in such company. Similarly, in case where foreign contractor is engaged to execute the work they also would prefer to have certain staff from the mother company. In this backdrop it is advisable to make provision for the issue of visa without needing work permit for top two positions, Chief Executive (whether called GM, MD, CEO or Executive Chairman), chief of finance and Project Manager of both the developer and the foreign contractor. The Section 9 and Section 35 of the Electricity Act, 2049 has made provision for entering into agreement and contract respectively for the implementation of the hydropower development policy. Most of the projects under construction to date have entered into a Project Agreement (PA) with HMGN and Power Purchase Agreement (PPA) with NEA. The trend so far has been to conclude an agreement, known as “Project Agreement,” between HMGN and the private developer for the development of each hydropower project. Each such agreement is ultimately approved by the cabinet, which takes place after securing concurrence of each of the concerned ministries including the Ministry of Law and Justice. Perhaps due to the fact that this document goes through such a process, someone opined that such an Agreement must be made to supersede law. However, such a scenario is untenable. (The person must have been thinking of a treaty between two sovereign nations, even, which becomes merely equivalent to an enactment upon ratification of it by the Parliament, thus putting such treaties at par with an Act of the parliament). The practice followed to date seems to be to include clauses on areas specifically covered by a number of enactment besides dwelling in various subjects regarding the negotiated business deals. Matters specified by Electricity Act such as provision of license for construction and generation of power, availing of land and houses owned by third parties, income tax holiday for first 15 years and 10 percent points lower for next 10 years, security arrangement, import duty exemption, royalty to be paid by the developer, etc. were also covered, to be applicable as laid down by the Act. Besides, it is also found to be dwelling on subjects like visa, which is covered by Immigration Act and work permit, which is covered by Labour Act. Probably due to the fact that this agreement deals almost exhaustively with most of the things that a hydropower developer needs to be involved in, tendency on the part of regulatory agencies has been to permit a developer to do only those things that are dealt with by the agreement. This is not correct administration of the Act. A developer should not be precluded from undertaking any legitimate business activity, although not covered by PA, unless such an activity is expressly restricted under prevalent Nepal law. What must not be lost sight of is the fact that a developer, if incorporated as a Company (which is the case most of the time), becomes a separate entity with perpetual succession, entitled to conduct all such legitimate activities that a natural person does, including filing cases in the court of law and be taken to court, etc. (except for exercising voting right). In view of this a developer must not be disallowed to do anything merely because it fails to get mentioned in the agreement. The officials of the regulatory agencies take this kind of stance because this agreement to their mind is a document that lists all the activities that it is allowed to be involved in. Such logic cannot be stretched to mean that any enactment or law that does not find mentioned in the Agreement does not prevail on the Project. In other words, notwithstanding the fact that certain law or Act may not have been mentioned in the Agreement, the Project is still under all currently prevalent law of Nepal. Moreover, HMGN can give facilities to the extent it is authorised by the law. No decision of HMGN can exceed the law. This can be better explained by using an example. Section 12(7) of the Electricity Act requires a developer to pay 1% as custom duty on certain items. Contrary to this provision HMGN cannot allow any specific developer to pay only 0.5% only as custom duty, unless HMGN makes a specific decision under authority delegated to it by the relevant Act. Conversely, it is also not true that the project does not come under the purview of a specific Act or any specific law only because of the fact that there is no mention of that specific Act or law in the Agreement. If it was true as such then the project will not have to be bound even by the Constitution of Nepal as it does not get mentioned in the Agreement. Thus, repetition of the provisions of the law in a Project Agreement is redundant except if especial authority is being used as delegated to HMGN by the Act to make available facilities beyond what is provided for by the Act. Therefore, instead of repeating provisions of currently prevalent law that are relevant to the agreement, there should be a single-sentence-statement purporting to say that all relevant provisions of current Nepal law will apply unless specifically otherwise stated in the agreement. The Cabinet of HMGN approves the Project Agreement but certain developers feel that it is not honoured by HMGN agencies other than MoWR/EDC. This has led them to believe that other sister Ministries do not respect MoWR. Such anomalous situation could result in discouraging other foreign investors from investing money in Nepal. They pointedly reiterated that every cause has an effect and such effect can cause further adverse impact. Section 9 of the Act envisages HMGN entering into an agreement with the bulk producer of power for the purchase of electricity. However, to date HMGN has not done so. Moreover, it also does not sound logical for HMGN to do so. In practice to date it is NEA that has been signing agreements with private producers for the purchase of power in bulk, known as Power Purchase Agreement (PPA). A PPA embodies assurance of the fact that the power produced by a developer will get purchased. It is felt that there should be a model of it, which will achieve standardisation and which also, will result in bolstering effective transparency. Under the umbrella of these two documents a developer signs agreements for financing the project with its investors on the one hand and the lenders on the other hand. Similarly, the developer also concludes agreements with a number of contractors, suppliers, insurers, etc. for the execution of the project. All these documents put together constitute the project document with a multitude number of parties involved. There are a few prominent problems in the implementation of the multitude of the project documents due to the way these are structured that rate mention here. Based on a circular issued by HMGN, these projects are being required to open letter of credit for the purposes of import. This was basically introduced to curb malpractice on the part of those involved in the business of importing for retail/wholesale trade in Nepal. However, requirement of letter of credit is impractical for projects, especially in the case of a project with foreign funding that are in a position to make direct payment to its foreign contractors and suppliers. At present import duty facility is granted only to a licensee. Therefore, even the contractors’ equipment like excavator, dumper, bulldozer, etc. are required to be imported in the project’s name. Due to this requirement a contractor pays for the construction equipment but is registered in the licensee’s name. This creates unnecessary complications, as the project becomes de jure owner of these without paying for them while de facto owner which is the contractor is deprived of the title over the property it actually owns. Moreover, the provision for the import of equipment for re-export on record (लगत) is unnecessary hassle for custom offices and it also deprives Nepal of 1% custom duty on such imports. Therefore, the contractors need to be allowed to bring all necessary construction equipment at 1% custom duty with the clear understanding that they are allowed to re-export the equipment that are not the integral part of the project. An executive order of the Commerce Ministry, HMGN published in Nepal Gazette dated 2049/8/15 expressly forbids export of imported raw materials, spares and capital equipment. This hinders import of contractor’s equipment by a foreign contractor who would want to re-export items that are of no use in Nepal after its use in Nepal and needed for their work somewhere else. This notification should be made inapplicable with regard to contractors’ equipment for those involved in the hydropower development. Visas and work permits are required for a foreign contractor’s expatriate staff but the contractor is not allowed to apply for them directly. Only the licensee is authorised to apply. In order to cut through the hassles of involving too many parties for routine matters as such a mechanism needs to be developed to allow the contractor to make application for these. HMGN is committed to grant necessary license for satellite phone to certain hydropower developers. But Ministry of Communication, the licensing authority for such communication equipment, does not even grant the license in the name of the developer company incorporated in Nepal. The most they would be persuaded to do for a hydropower project is to grant such license in the name of an expatriate staff of the Project. Certain investors/developers and potential investors/developers feel that the fundamental rights of “Right to Information” that is enshrined in the Article 16 the Constitution of Nepal gets abused at times . Due to this whole thing gets politicised in the name of TRANSPARENCY at times. There have been times when cases were filed in the Supreme Court to force the release of documents. Private sector cherishes and thrives in CONFIDENTIALITY and it is not always sinister nor is it wise to impute sinister intent to request for confidential treatment by the private sector. Even advanced countries like United States have provision for proprietary information that does not need to be made public. While governmental agencies and its corporations are required to be transparent. Recently certain projects were asked to pay 1% of the project cost in order for HMGN to provide necessary security to these projects. This has not gone down very well with the investors. Section 31 (1) of Electricity Act makes provision for the arrangement of security of a hydropower plant but there is no mechanism under which HMGN can demand such payment, if HMGN is making such arrangement on its own initiative. HMGN will be in a position to make the licensee bear such expense only if the request for the security arrangement comes from the developer under Sub-section (2) of this Section. Security is the primary responsibility of HMGN except for the internal security of the Project. Therefore, it becomes the natural obligation of HMGN to make necessary security arrangement to maintain general law and order in the settlements around the Project sites, which are bound to grow both in shape, size, diversity and quality with the implementation of the project. The cost of security related to population dynamics is obviously for the account of HMGN. It cannot be denied that facility to import with import duty exemption has potential for misuse. However, in the name of control of misuse of facilities by a developer of hydropower project HMGN’s activities should not result in harassment. Besides all control mechanism have the built in possibility of it breeding corrupt practices. Industrial Enterprises Act, 2049 has made provision for “one window” that is based on the Department of Industry (DoI), the same is applicable for the purposes of Foreign Investment and Technology Transfer Act, 2049 while Electricity Development Centre (EDC) is has been named to be the “one window” for the purposes of hydropower development. A foreign investor at the moment is required to go through two sets of one window in order to set up a company for the development of hydropower and get on with it. Department of Industry (DoI) is armed with an “One-Window Committee” under the chairmanship of the Director General of Industries Department and with Director-Generals from several departments like Custom, Excise, Tax, Commerce, etc. as members . This committee has specific functions, duties and powers spelt out in the Act . The one window of Industries Department stays active in the case of a hydropower project in which foreign investor are involved till the financing agreements including joint venture agreements gets approved culminating in registration of these documents under FITTA and then it takes the back seat. Prior to granting concurrence to these documents this Department studies the documentation and even make requests for changes in these documents. This department also grants registration as Energy Industry to specific hydropower projects. The EDC has different responsibilities at various stages. In the first stage of hydropower development (inception stage) it has two-fold responsibility: issuing license and concluding Project Agreement. The first part of this role is visualised by Section 4 of the Electricity Act . Project Agreement is the instrument executed between HMGN and the developer, which works as a bridge between various documents . Thereafter, it co-ordinates efforts to garner necessary permits and approvals in order to achieve the financial closing. These include, inter alia, consent and agreement between HMGN and lenders, legal opinion of HMGN’s legal counsel, lease agreement for forest between HMGN and the developer, permit to operate convertible foreign currency bank accounts within and without Nepal, permit for procurement, transportation and usage of explosives, etc. During the construction and operation phase EDC helps make arrangement to secure import duty facility, in the acquisition of visa/work permit and so forth. It will be also be involved in assisting the developer in the repatriation function during the commercial operation period. The situation obtaining at present is so difficult for the developers, in their desperation various suggestions have been made. Some recommended forming an advisory Board with representatives from various Ministries. Others felt that EDC would become effective if other Ministries are made to co-sign the PA in order to have them extend full co-operation . Claims were made that in other countries governments do the follow through on behalf of the developer. Similarly, it was expressed that EDC should go to other agencies to get necessary approvals and give the necessary response to the licensee thereby playing the role of a real “one window.” An example of Pakistan Private Power Infrastructure Board (PPIB) was cited which does the follow through, through one of its staff known as “advocate.” Certain others came up with the suggestion that EDC should be turned into implementing agency attached to the Prime Minister’s Office. Some thought the problem emanates due to lack of stature on the part it and recommended upgrading it to a Ministry. The phrase “one window” itself is borrowed from a situation where the person seeking help stands in front of a window and the person behind the window does all that is requested. This precludes the necessity for the person seeking help having to go from door to door (running from pillar to post). Frustrated developers have even compared EDC with a Post Office through which all letters have to pass through. Possible solution of the present hiatus lies in creation of a NODAL AGENCY armed with necessary authority and facilities to fulfil the all in one truly “single window” function on behalf of HMGN for the development of hydropower. Electricity Development Centre can be made such an agency (whatever name is chosen as long as the objectives set out for it could be achieved). First of all, as hydropower is a special type of industry, this NODAL AGENCY, therefore, needs to be designated as the “department” under FITTA for the purposes of hydroelectricity based industry. This will abolish the need to have to go to DoI for approvals under FITTA. Besides as this agency will be specialising in the foreign investment in hydropower sector it will attract and will be filled with manpower with special talent in this field. This will turn this agency into the hub centre of activities for hydropower development. Then, at the initiative of this agency all the permits and approvals must be forthcoming from concerned agencies during the course of getting concurrence to the Project Agreement itself from various arms of HMGN related with such activity. Actually finalisation of Project Agreement can and should go hand in hand with the approval of the foreign investment agreements. Finally and most importantly, also during the process of getting concurrence from various Ministries of HMGN, each of these Ministries should be made to formally delegate project specific authority to this agency for routine activities like import duty facility, thus, allowing it to approach frontline agencies of HMGN like Tribhuvan Airport Custom Office . This will enable this agency to write letters directly to front-line offices that come in the picture . Copies of such authorisation must be made available to the NODAL AGENCY, the concerned frontline agencies and the developer. Company Registrar’s Office is another regulatory agency for the purposes of incorporation of a Company and thereafter, monitoring its corporate affairs. Happily there have been very few hassles emanating due to the nature of its role and work requirement. The extant institutional framework, their regulatory functions and the manner of their working also has some room for improvement. Moreover, the mechanism of “One Window” is in need of strengthening by raising its stature and empowering it all necessary authorities. It is not to say that present institutional framework has not succeeded in accomplishing what was envisaged to be accomplished. The proof of its unmitigated success lies in the fact that a number of hydropower projects are undergoing construction. However, one needs to learn from the experience during the above trials and tribulation and improve for better and enhance the effectiveness the institutional framework. 8.7.1.1 Since there is no guarantee as to whether a survey licensee gets generation license when these licenses are granted on the basis of competitive bidding a mechanism needs to be developed in order for the survey licensee to recover its cost of the feasibility study in case it fails to bag the generation license, eventually. Private sector prefers to have an arrangement under which the survey license holder would have the first right to the development license. 2.7.1.2 Granting of licenses on the basis of competitive bidding is definitely a better method. However, evaluation of competitiveness of the bids on the basis of the cost of the project is not suitable for a hydropower project. Parameters of the bidding needs to be changed to what Nepal stands to gain rather than how much will the developers spend. 2.7.1.3 Rather than doing away with the provision for the issue of license for hydropower project of up to 10 MW capacity it is recommended that the procedure for acquiring license for a project of such scale is simplified because a license has an important role to play in the matter of asserting water right. 2.7.1.4 It is imperative that a hydropower plant remains operational, for a substantial number of years, even after the expiry of the license, in order for the hand-over of hydropower plant thereafter to be meaningful. Therefore, the PA needs to lay down design life of the Project where it gets handed over to HMGN after expiry of the license. Moreover, design standard and construction standard also must be developed and implemented. It is recommended to make provision for the issue of visa without needing work permit for top two positions, Chief Executive (whether called GM, MD, CEO or Executive Chairman), chief of finance and Project Manager of both the developing company with foreign investment and its foreign contractor. 8.7.3.1 A Project Agreement should have a single sentence provision stating that current Nepal law is applicable instead of repeating all pertinent provisions of the law. The private sector is willing to accept it subject to the condition that EDC takes the responsibility to compile up to date versions of all relevant laws and make them available. The Project Agreement should have detailed provisions when HMGN is using discretionary authority vested in it by specific provision of the law. In other words, however, departures from law must be specifically stipulated in the Agreement. In the case of Power Purchase Agreement these should be standardised, which will result in boosting effective transparency. 2.7.3.2 Letters of Credit for the import by a hydropower developer should not be required, especially in the case of a project with foreign funding that is in a position to make direct payments. Similarly, the contractors should be allowed to import all the necessary construction equipment at 1% custom duty in their own name with clear understanding that they are allowed to re-export equipment that are not the integral part of the project. Moreover, the contractors should be allowed to apply directly for visa and work permit for its staff in accordance with the prevalent law. Since hydropower development work generally takes place in the remote part without communication facility all hydropower developer and their contractors should be granted license for satellite phone with least hassle. 2.7.3.4 The private sector should be asked to bear the cost of security under Section 31(2) of Electricity Act only in case the developer has asked HMGN to help it with the internal security of the Project. HMGN must bear full obligation of making necessary security arrangement to maintain general law and order in the settlements around the Project sites, which are bound to grow both in shape, size and quality with the implementation of the project. This is important to enable the developer carry out the work for which it has been licensed. 2.7.3.5 In the name of control of misuse of facilities by a developer of hydropower project HMGN actions should not result in harassment and impose control mechanism which may breed corrupt practices. However, use of import duty facility needs to be monitored to prevent its misuse. For this purpose also number of agencies monitoring the project must be curtailed and the NODAL AGENCY must adopt scientific measures to see to it. 2.7.4.1 Electricity Development Centre (or any agency to be created to function as the all in one truly “single window” arm of HMGN) needs to be made a NODAL AGENCY armed with necessary authority and facilities with special reference to hydropower development. First of all, as hydropower is a special type of industry, this NODAL AGENCY needs to be designated to have the authority of the “department” under FITTA for the purposes of hydroelectricity based industry. 2.7.4.2 For the sake of empowerment of this agency and to raise its stature too necessary legislative change should be made to empower HMGN to constitute a Hydropower Promotion Board to be chaired by the Minister of Water Resources with high level representatives from all relevant and related ministries and departments (the Director Generals from Departments and Joint Secretaries from the Ministries). Specific functions, duties and powers needs to be assigned to such a Board in order to ensure that work related to hydropower development moves on the fast track. This NODAL AGENCY should be designated to work as the Secretariat of such a Board with its Director General as the Member Secretary. 2.7.4.3 It is recommended that a clause is added to the Project Agreement listing the permits and approvals necessary to reach Financial Closure and during the course of getting concurrence to the Project Agreement from various arms of HMGN related with such activity such permits or approvals are to stand granted by the respective agency, with the final seal of approval to these coming from the Cabinet when the agreement is approved by it. 2.7.4.4 Finally and most importantly, also during the process of getting concurrence from various Ministries of HMGN, each of these Ministries should formally delegate project specific authority to this agency for routine activities like import duty facility, thus, allowing it to approach frontline agencies of HMGN directly. Copies of such authorisation must be made available to the concerned frontline agencies, the NODAL AGENCY and the developer. 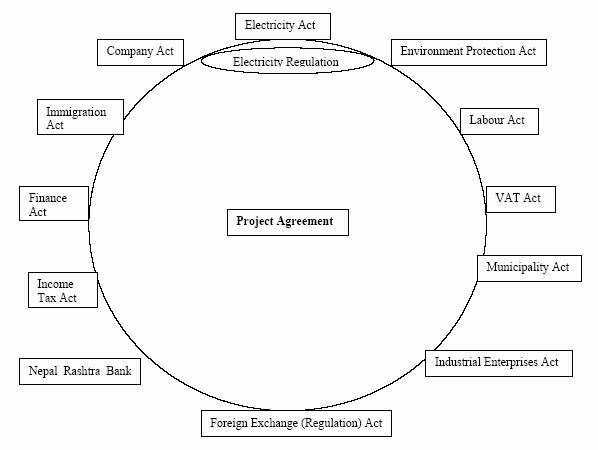 This is the second chapter of the report on the Study of Legal Framework and Institutional and Regulatory Process for the Development of Private Power Projects in Nepal , prepared in the capacity of the Legal Specialist, in June 1998. A set of four separate working papers were presented in a one-day workshop on “Legal and Institutional Framework for Hydropower Development in Nepal” based on the above study, in June 1998. 1. Sub-section 1 dwells on how an application for the purpose is submitted and the Sub-section 2 fixes the time frame within which a license, whether for survey or generation, transmission or distribution has to be granted. 2. Sub-section 2 of Section 5 of Electricity Act has fixed 50 years as the maximum term of a license for generation, transmission or distribution of electricity. 3. Under Sub-section 1 of Section 10 of Electricity Act the ownership of the land, building, equipment and structure related to the electricity generation plant or transmission and distribution line vests in HMGN after the expiry of the term of the license in the case if foreigners hold more than 50% of the total investment in the developing company. 4. In Sub-section (2) of Section 21. 5. Generally one month’s salary package for an expatriate can pay a Nepali of the same level of expertise for over four years – 48 months. 7. The first one being employment generation and second and more important one being technology transfer. 14. Section 18 of the same Act lays down the functions, duties and powers of the Committee. 17. Discussed at length in Chapter 4 of present Report. 18. Chapter 9 of this report deals with the Project Agreement. 19. Seeking and garnering of concurrence on the Agreement proposed to be concluded between the parties, from all the relevant ministries tantamount to their co-signing the Agreement. The important thing to be remembered in the context is the fact that this document is backed by the approval of HMGN Cabinet. 20. Another type of example of an effective delegation of authority will be to authorise the Department of Forest (DoF), in principle, to enter into Lease Agreements with the specific project for the lease of forest identified to be necessary for the implementation of the project. This will obviate the need for DoF to await grant of approval to lease a patch of forest to the project from the Cabinet or the concerned Minister, every time the project needs to lease a specific patch of forest. 21. 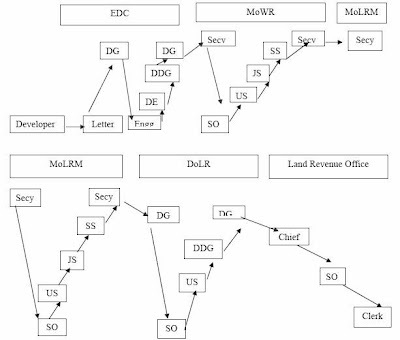 In the above example EDC will write to DoF to conclude a lease agreement for the forest identified and DoF will be in a position to do so in the matter of a few hours as it already has the authority delegated, in principle, to sign lease agreement for lease of forest the purpose of a specific project.